This entry was posted on September 14, 2018 by Marketing. Most of us likely think of fix-and-flips as investment deals that require renovation know-how or at least the ability to hire skilled contractors with that knowledge. The truth is that today’s fix-and-flip residential housing market is far broader than that. In fact, savvy real estate investors don’t even have to shop around for the right house to buy, rip up flooring, paint or even break a sweat to make money in residential real estate. You can bypass a key challenge that many current residential fix-and-flip investors face: dealing with a severe shortage of affordable inventory. How can you earn a similar return without the angst of finding a house and rehabbing it? By investing in other real estate developers’ projects via Patch of Land's investing platform. Patch of Land provides an online platform where accredited and institutional investors seeking high-yield, short-term, asset-collateralized investments can discover properties that meet their investment goals. Borrowers seeking timely and consistent sources of funding for renovating and flipping properties have contracted with Patch of Land to provide their financing, and we offer a select group of these properties to our investors. Investors on Patch of Land’s platform are currently earning up to 12% and receive monthly interest payments on their investments directly into their online accounts. Sign up on the platform. It’s quick, free and doesn’t require any commitments. Select the real estate deals in which you want to invest. You can build your investment portfolio from curated, pre-screened real estate projects and can view full financials, photos, appraisals, and documents to help you decide. Invest. It’s as easy as clicking the “Sign Up Now" button on the Investment Detail page and entering your funding amount. Sign the Investor Agreement electronically. Transfer funds. Pay for your investment via automatic bank draft or wire without concerns about security. Accounts are secured by bank-level security measures and your investment information is stored on PCI-compliant, encrypted storage systems. Upon project completion, the borrower repays the funds to Patch of Land and we pay the investor. You can either choose to reinvest in another project or withdraw your earnings. 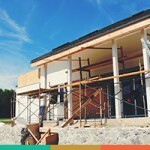 As you see, fix-and-flip is not all about hammers and paint. It’s time to start thinking about real estate investing in new ways. We aren’t all wired the same way. Some of us have the desire and the skills to spot a fixer-upper, to submit an appropriate bid and to hire out or do the rehab ourselves. Others of us may have full-time careers, yet we desire to diversify our financial portfolios with residential real estate investments. Online platforms such as Patch of Land now offer a highly sophisticated yet easy-to-use method to make that possible. Have questions? Connect with us at [email protected]. We look forward to helping you find your next real estate investment. This entry was posted in All Projects, Building Wealth and tagged Earn Money, AutoInvest, fix and filp real estate investing on September 14, 2018 by Marketing.